So. Just out of curiosity... how many “fall décor” images have you pinned? How many pumpkins have you purchased? And how many “PSLs” (holy moly, they are actually calling pumpkin spice lattes “PSLs” now) have you ordered? Me? Zero. Zero. And zero. Fall just isn’t really my jam. I don’t really seasonally decorate (except for Christmas), and I’m not particularly excited about the dropping leaves or cooler weather. It’ll probably be business as usual, décor-wise around here, since I basically pretend that summer lasts until Thanksgiving. Sorry I can’t share in your enthusiasm, dear readers! I am just missing the Fall Appreciation Gene. It’s ok, it’s not fatal. The only thing I enjoy about fall is the shift in food, just because I get tired of summery foods and I’m ready for something new. Soon enough, I’ll have roasted vegetables and stews and inevitably something made with pumpkin. But for today? Let’s have one last summery hoorah with a light pasta made with goat cheese fresh veggies, based on this pasta from What’s Gaby Cooking. 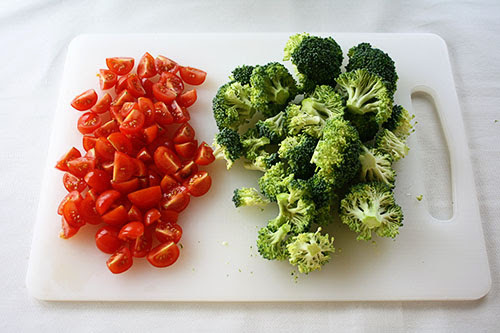 You need broccoli and tomatoes. You need them now before they skyrocket in price. Then you need to start roasting that broccoli. I showed you how I do that here. 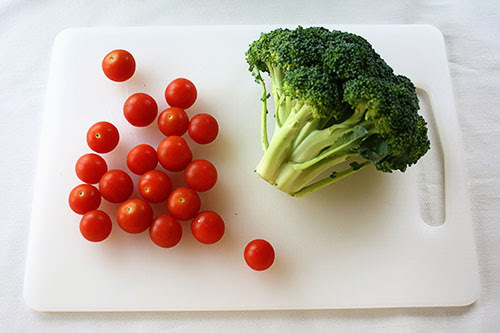 Go ahead and season it with salt and pepper before roasting. 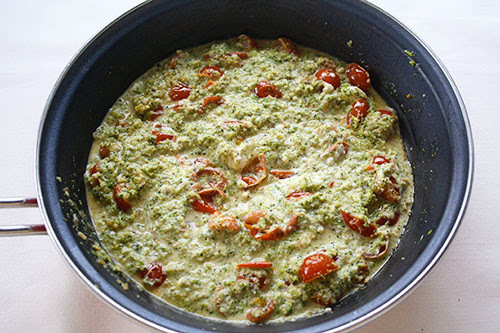 Oh, and if you happen to have leftover roasted broccoli, that will work great in this dish! 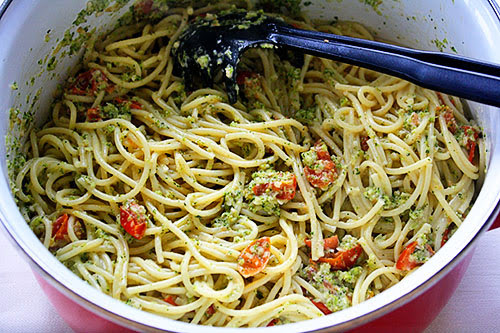 You should also start boiling some pasta in salted water. I used a pound of spaghetti noodles. Easy! 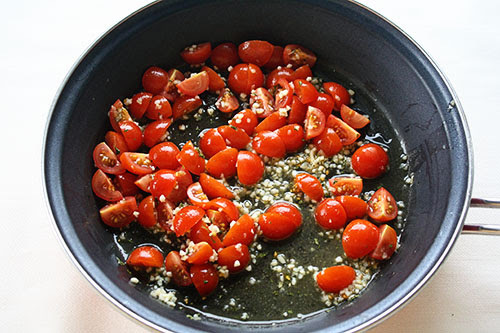 Add the tomatoes with some dried basil, salt, and pepper (maybe dried onion if you’re feeling it.) Then cook them over medium heat until they’re tender, for just a few minutes, and set aside. Okay. About that broccoli, which should be done roasting around now. 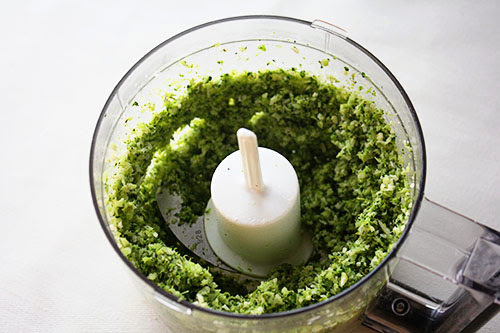 It needs to be pesto-ified in a food processor. I had to do it in stages because my food processor is little. Still, no need to measure. 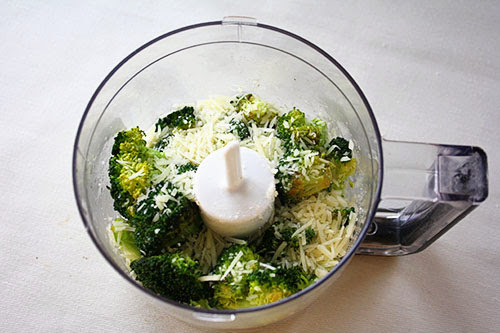 Broccoli, shredded parmesan cheese, PULSE. 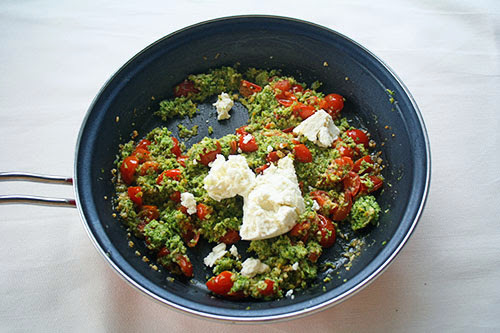 Broccoli pesto! 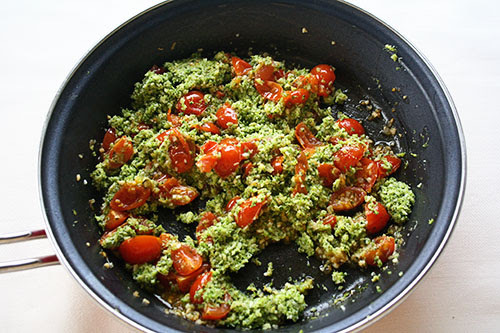 It sounds so fancy, and yet all you did was turn broccoli into baby food. And add... wait for it... GOAT CHEESE. 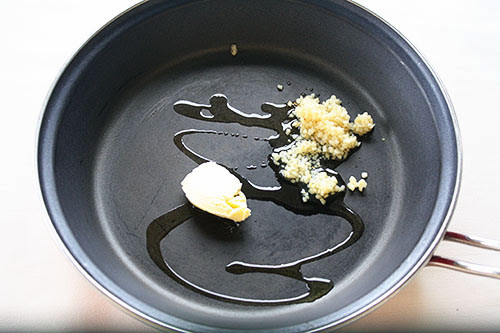 Delicious, creamy goat cheese. I added several ounces (it’s what I had on hand), but you can add as much as you want, because every pasta is better with goat cheese! ... and suddenly you have a sauce. Just like that! If you’re clinging to summer, or just need an easy veggie-heavy weeknight dinner, this is your guy. Enjoy! Monday: chili! Because it’s cold and chili is one of the only great things about cold weather! Happy very-very-tail-end-of-summer – or okay, FINE: happy fall, everyone!